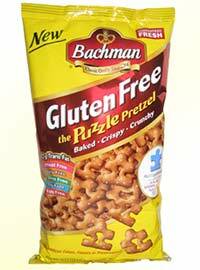 The Bachman Company has introduced a new gluten-free Puzzle Pretzel in the shape of the Autism Speaks puzzle piece logo. The product, packaged in 10 oz. bags, is free of casein, wheat, soy and eggs and is produced in a dedicated gluten-free facility. Five percent of net proceeds from the new pretzel are donated to Autism Speaks. Bachman, headquartered in Wyomissing, Pennsylvania (near Reading), has partnered with Autism Speaks, the largest non-profit organization dedicated to increasing awareness of autism spectrum disorders, funding research into the causes, prevention and treatments for autism, and advocating for the needs of individuals with autism and their families. Bachman's partnership with Autism Speaks began in 2007, with the placement of autism information stickers on the bags of their most popular snacks. Bachman products can be found in supermarkets throughout the northeastern United States; in addition, the new pretzels can be ordered online through the company's store. The company's other gluten-free snacks include Jax cheese twists, potato chips, tortilla chips and popcorn.